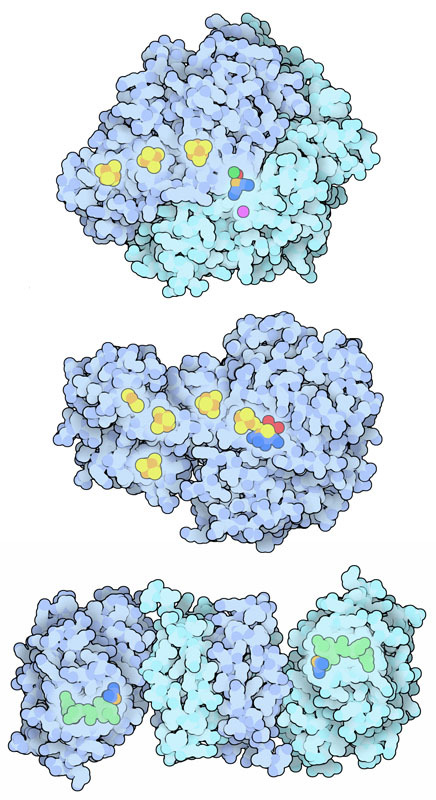 Nickel-iron hydrogenase (top), iron-iron hydrogenase (center), and iron hydrogenase (bottom). Hydrogen gas is an unusual substance. Normally, it is stable and must be coaxed with powerful catalysts to enter into chemical reactions. But when mixed with oxygen, a tiny spark will set off an explosive chain reaction. Hydrogen gas holds great promise to be the greenest of green energy sources. It has many advantages: compared with many fuels, it releases a lot of energy for its weight, and the reaction forms only energy and pure water. It has substantial disadvantages, however. It is dangerous to store, and it is difficult to perform the reaction in a controlled, non-explosive manner. Currently, the fuel cells being developed for use in hydrogen-powered vehicles use costly platinum catalysts to perform this reaction. Researchers are now looking to nature for other alternatives. Enzymes that split hydrogen gas have evolved at least three separate times in the history of life on the Earth. These enzymes are used either to split hydrogen gas for use as energy, or to create hydrogen gas as a product of their reaction. Three examples are shown here. At the top is a nickel-iron hydrogenase (PDB entry 2frv ), in the center is an iron-iron hydrogenase (PDB entry 1feh ), and at the bottom is an iron hydrogenase (PDB entry 3dag and 3f47 ). As the names imply, all of them use metal ions in their reactions. The three types of hydrogenases use different combinations of metal ions and cofactors to activate hydrogen. The active sites of nickel-iron and iron-iron hydrogenases are buried deep within the proteins. The reaction begins when hydrogen diffuses through little channels into the active site. First, the enzyme breaks hydrogen into two pieces: a proton (H+) and a hydride (H-). Then, the electrons are stripped off of the hydride and transferred down a string of electron carriers, and the two protons are simultaneously shuttled to the surface. Iron hydrogenases are slightly different: a special cofactor binds in the active site at the beginning of each reaction, and this cofactor accepts the hydride when the hydrogen molecule is split. The active site complexes are an unusual combination of metal ions and strange molecules such as cyanide and carbon monoxide, held in place by cysteine amino acids. These complicated active sites are constructed by a dedicated set of maturation enzymes. For instance, the nickel-iron hydrogenases require at least seven enzymes, powered by GTP and ATP, to build their active sites. One of these enzymes acts as a chaperone, bonding to a key cysteine in the active site and wrenching the protein open to make it accessible to the other enzymes. They load in metal ions and add the cyanide and carbon monoxide ligands. Finally, the chaperone protein releases the cysteine and the mature hydrogenase snaps shut around its new active site. Electron transfer complex of iron-iron hydrogenase with cytochrome c553 (red). Hydrogenases need a place to dump all the electrons extracted from hydrogen. In some cases, these electrons are transferred to electron transport proteins such as cytochromes. In this structure solved by NMR spectroscopy (PDB entry 1e08 ), an iron-iron hydrogenase (blue) is caught in the act of transferring its electrons to a cytochrome (pink). To look at this complex in more detail, take a look at the page at Proteopedia. 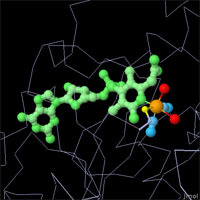 X-ray crystallography has revealed the active sites of all three types of hydrogenases, but mysteries still remain. 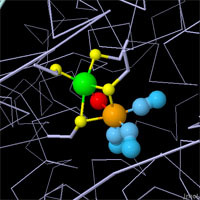 Hydrogen is too small to be seen in most crystallographic experiments, so other methods must be used to discover the specifics of the reaction. The active sites are all different, but they have compelling structural similarities. All are centered around an iron atom with several unusual ligands, such as cyanide ions and carbon monoxide. Each has another metal ion or cofactor to assist the iron atom with the reduction/oxidation reaction. And they all use cysteine amino acids to hold everything in place. Click on the images above to take an interactive look at each active site. 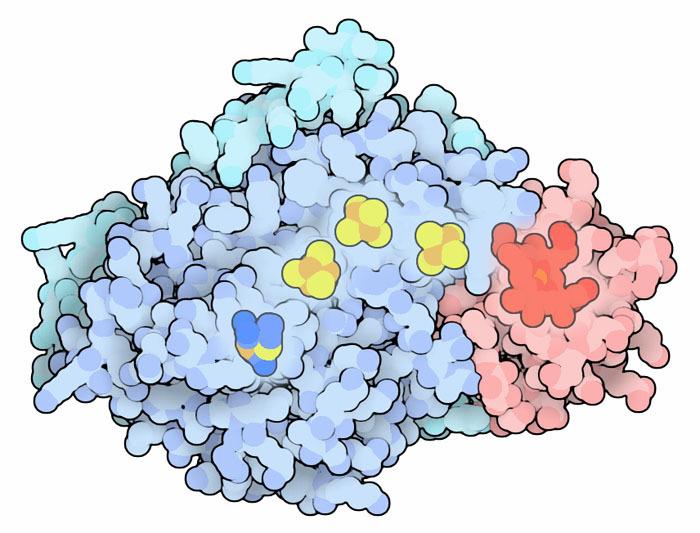 You can get an up-to-date list of proteins related to Hydrogenase by clicking on any of the accession codes in this Molecule of the Month, and then using the tab named "Sequence Similarity" at the top of the page. PDB entry 1hfe is an iron-iron hydrogenase from a different organism than the one shown here. 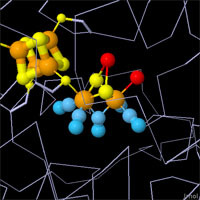 It has a different set of ligands coordinated around the active site iron atoms. Can you see similarities and differences with the one shown here? Researchers are exploring the possibility of using hydrogenases for the production and use of hydrogen in technology. What challenges might they face? A.L. DeLacey, V.M. Fernandez, M. Rousset and R. Cammack (2007) Activation and inactivation of hydrogenase function and the catalytic cycle: spectroelectrochemical studies. Chemical Reviews 107, 4304-4330. K.A. Vincent, A. Parkin and F.A. Armstrong (2007) Investigating and exploiting the electrocatalytic properties of hydrogenases. Chemical Reviews 107, 4366-4413. M.R. Leach and D. B. Zamble (2007) Metallocenter assembly of the hydrogenase enzymes. Current Opinion in Chemical Biology 11, 159-165.